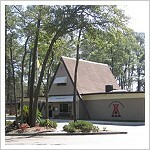 The Savannah South KOA is a good overnight stop with easy access to I-95 but just far enough away from the highway for some peace and quiet. This is a very pretty property! There are lots of tall trees and shaded pull-thru sites. They have a real nice 35 acre fishing lake with lots of waterfowl. This is a good campground if you’re looking for a little quiet relaxation. The restrooms and facilities were clean but in need of a little remodeling. The staff was friendly and helpful. There were some permanent sites near the back of the campground, which turned us off. Access was a little difficult for our large motorhome, and the pull-thrus were a little narrow, but we made it in OK. They had a coin-operated RV wash that was handy too. A nice and busy place. There’s a hunt club in the adjoining property, and between the two properties, there’s a good flat dirt road for a mile and a half (each way) run, plus it’s about a mile from route 17 (the entrance) to the end of the park (where there are permanent residents–nicely hidden in neat Kamping Kabins). So you can get in a nice walk or run. No wireless cable–a big disappointment. About 35 a night (30 with the KOA discount). A nice overnight, even with the garbage truck beeping its horn about a dozen times at 3 am.